Conceivably, there's any number of ways to start off a review regarding beef jerky, so let's do something a little unexpected here: respect for vegetarians. No, seriously, I mean it. Can't speak for all vegetarians, for their any number of reasons for deciding to eschew meat, but for me, who's dabbled in it: it's tough. At least was for me. I've given meat up for a length of time during Lent, and for also about a six month period a couple years back (primarily for weight loss reasons - I was a big boy), but it's just kept bringing me back. Fortunately, I've figured out a way that works for me to incorporate mucho carne* into my diet and still lose considerable weight - namely, Paleo. I get the arguments for a plant-based diet and I know that going Paleo, in careless application, can mean too much meat overall, looking at it realistically from an evolutionary standpoint, but...I needed to find something that worked for me to get me healthier, which primarily for me means losing a lot of weight (I've lost about seventy since last August). Vegetarianism was great, in a lot of ways, but in the end wasn't for me. Paleo, despite forgoing lots of former favorites like cheese and bread (oh grilled cheese, how I miss you - if you're in/near the 'burgh, check out this place), does. If you're on a similar journey, I hope you find what works for you and you stick to it - lots of hard work but it's so, so worth it. All this to say: palatable portable protein is a must for my busy schedule. I don't get it often, but I love good quality jerky, so when Trader Joe's debuts some South African Inspired Biltong Beef Jerky, I gotta give it a try. This isn't quite like most jerkies I've had. Instead of indiscriminate chunks or (shudder) Slim Jim style, the beef for the biltong is cut into neat little strips. The write up on the back says it's from the rump, cut following the grain of the muscle. I'm not all that up on my cuts of meat to know if that's different than most jerky, but I will say this style is noticeably tougher and chewier than most. 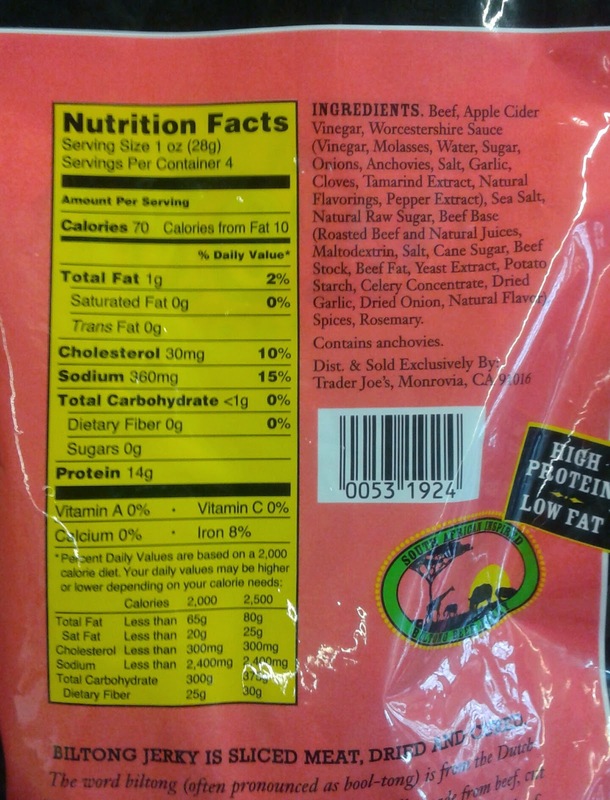 There's also not nearly as much fat as would be expected from bovine posterior,not that jerky has all that much usually anyways, resulting in lean, tough meat that will get your teeth working to get through. Almost more venison like in some ways. This is a plus - while I can easily overdose on other jerky, this was too much to eat more than couple strands at a time. The seasoning's a bit different, too. Instead of being marinated in a bath of whatever with little to nothing on the exterior, each piece of the biltong is liberally coated with a thick dusting of spices - lots of pepper and garlic, and yes, salt. To my recollection, the seasoning tasted pretty similar to what's on the South African potato chips, but it seemed deeper and fuller with its beefy base. As with most jerky I try, I had my work buddy, Alan, give it a try too. Now, he's actually been to southern Africa and has stated he lived on biltong and Coca-Cola for about three weeks, so I'll trust his opinion more than mine. "Hrmm," he said, giving the first bite a chew. "The texture's just about perfectly right, but the seasoning...." He looked on the back of the bag. "I'm going to go out on a limb and assume that where I was, there wasn't Worcestershire sauce. Or apple cider vinegar." Probably true. "Not bad, just needs some bloodborne pathogens and the occasional maggot, and it'd be somewhat close enough to what I got from the market in Africa. But it's been a while." Well, he liked it, I like it, heck, even the wife (usually ambivalent about things like beef jerky) liked it too. "Heck, whenever you'll buy it, I'll eat it," she said, which is about as ringing an endorsement I could expect from her. 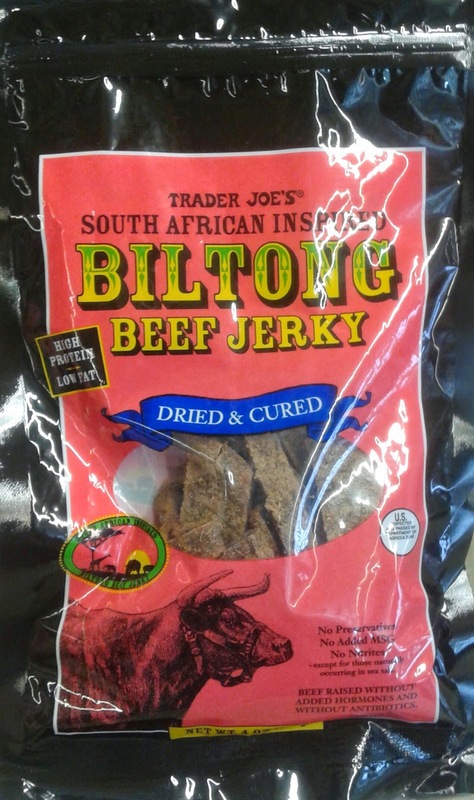 Like most TJ jerkies, the biltong was in the roughly $6 range for the quarter-pound package. It won't be an everytime pickup, but this will definitely be in the work snack rotation going forward. * Sorta. Still learning the whole "portion control" thing - have gotten much better, but still. Haven't tried this yet, but will take this opportunity to share my original and 'secret' TJ's jerky treat. It's pretty simple and vey tasty. Just buy a package of their Bool Kogi, and then lay out the strips and dehydrate them! Drop the price by $1.50 and they have something going. The problem with high-priced jerky is you start thinking "Maybe I'll buy a New York Strip steak instead, it's cheaper." There are loads of vegan jerkies available now, by the way, using soy or wheat gluten or mushroom as the base for the ones I've tried. Maybe TJ has some? Otherwise, Stonewall Jerquée, Primal, or Tofurky types are good to try. Smofu has one based on tofu which is very dry but somehow mesmerizing. You probably burn more calories chewing it than you get from the package. You might need a lot of protein and fat, which you can indeed get as a veggie but many people skimp on fat especially when they go veggie or especially vegan. Fat is good... Paleo doesn't skimp on fat which is probably why you're doing well on it. You can mix and match, though. There are even veggie adaptations of paleo (they're looser on grains and legumes and grain-like things such as quinoa). I am devoted to Trader Joe's and this may be jerky but is nowhere close to biltong. Dreadful - and could give biltong a bad name.